How would I describe the OlymPicnic Games? 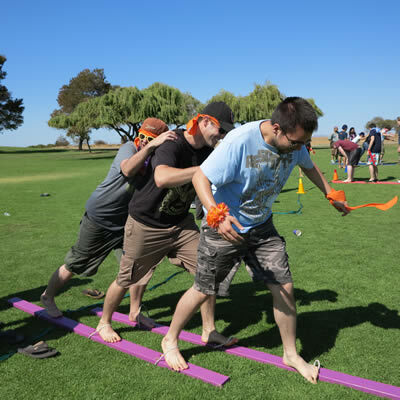 Company Picnic Games - Team Building Games - Entertaining and Motivating - With up to six sets of color-coordinated equipment, and a playing field decorated with color-coordinated flags and cones, Alan Sands plays company team building and corporate picnic games packages. 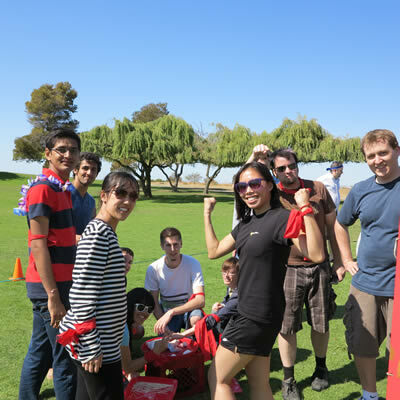 Alan creates teams from your group and give them matching colored arm bands. 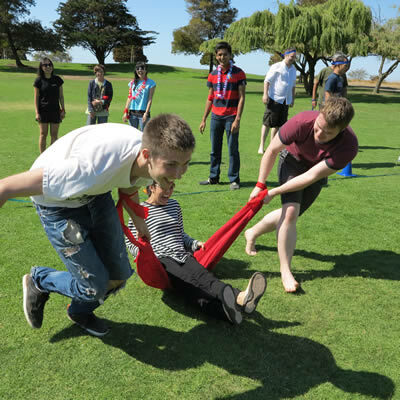 Your Company or Group then play 12 classic, twisted & eccentric Team Building or Picnic Games designed to make your guests play together, interact and trouble solve as a group. No one sweats, no one gets hurt but people do learn how to laugh. Everyone interacts closely as they strive to reach simple goals. You will learn who your leaders are, who are good team players and teammates and who is shy. ASE makes leaders out of those who are not normally in charge and makes every effort to get the shy ones out there and playing with everyone else. What Age are they good for? 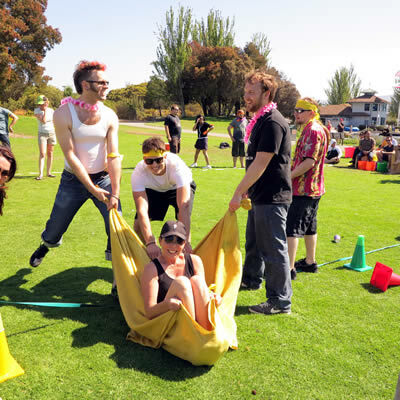 Originally they were company picnic games, so the classic field games we play are for everyone age 7-107, and if you are under 7 we ask parents help them participate since we do not have time to run the group and care-take the little ones. By age seven, most people comprehend how to bluff their way through our group instructions and play along. 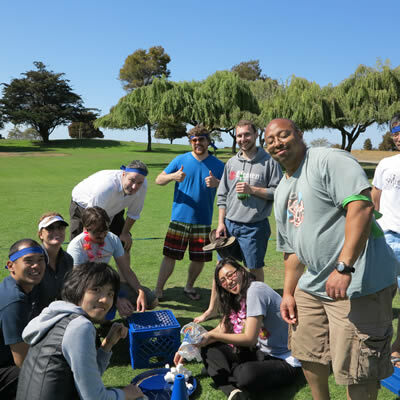 Are they picnic games, or are they for team building? It depends on the group and what you are looking for. ASE has dozens of games we draw from. 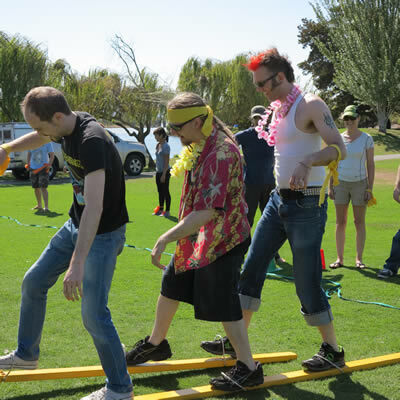 Some are more challenging and teambuilding like the PVC Go Cart Building - others are simply fast-paced fun- like a shoe kicking contest. We have played in board rooms that measured 20 x 60 and on racetrack infields. It depends on the size of your group. Outdoors we usually want a 100' x 50' area to "play" and others stand around and watch - or jump in and out as they want to participate. What Surfaces can you play on? In a perfect world, we play on a nicely groomed, level grass lawn like a golf course – that don't happen often. ASE's OlymPicnic Games have been played on dirt, indoors on carpet & tile floors and in parking lots. People do fall down. Playing on pavement or concrete is not choice but has been done many times. 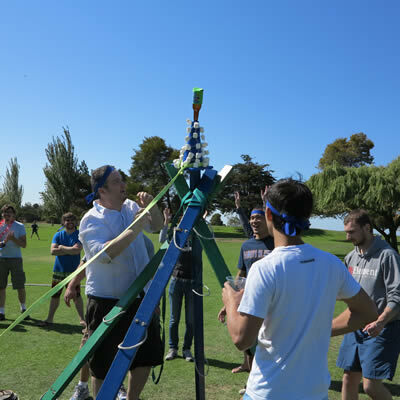 Not all games have to be "field-style" games. We have created custom games for international sales teams to meet the domestic support team and they played trivia regarding their products and games where everyone was in suits in an office. We have layed carpet in parking lots, but that does not create a perfect surface. Level clean grassy fields are always best, but we will make due with what we get. Each situation presents a different set of logistics. We have a warehouse full of equipment. 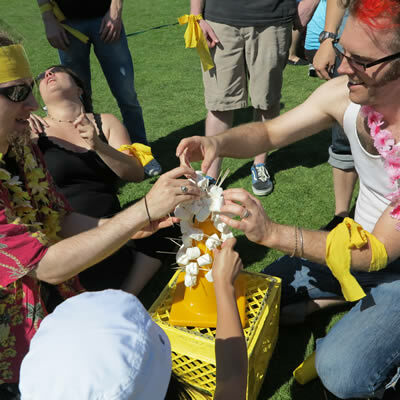 From H20 Balloon Toss to PVC Tower Building, Product Name Bingo, to Four-Person Sack Races; Marshmallow Toothpick Building to PVC Go-Cart Building; each group is different and we will write you a custom proposal to meet your needs. What will we, the Purchaser, need to supply ASE? Depending on what games we play we usually can supply everything for you. We can also find you: a caterer, a location, transportation, invitations and security. Our strongest talents are supplying the talent and equipment to do the games themselves. However, we will work with you and make your event successful anyway we can. 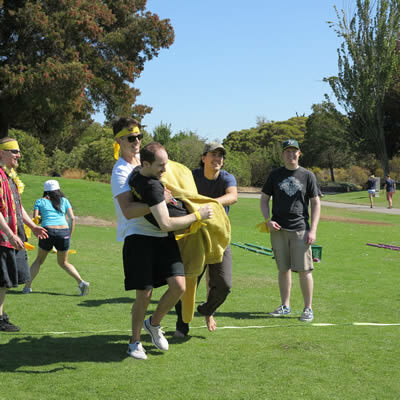 Usually ASE's OlymPicnic Games packages are 75 minutes, but we have done shorter and longer events. If the group is HUGE, we can do sets of games lasting 45-minutes each stretched over 3 to 4 hours. We find a strong set of games that lasts over one hour, but less than two is usually perfect. If people are drinking alcohol, keep the games shorter. They will usually lose interest once they have had a few. If the day is hot and we are outdoors, also the games will usually last less time. Alan, at the age of 12, moved with his father to the Catskill Mountains of New York State where they both began working for hotels and resorts as part of the activities staff. Like on a cruise ship today, there were staff members who ran games, contests and entertained the guests all day and night at these resorts. By day, Alan's Father, George Sands, was an activities director. At night, Alan's father traveled to the different resorts and performed his comedy Magic and Mind Reading Shows. Alan's father had an idea; "Every hotel has an activities director, and they have a day off of work. I could be the 'Activities Director for the Day' and go and play games, trivia, run activities during the day and then at night do my show." George never brought his idea to fruition, but he did plant a seed in Alan. When Alan moved to California permanently in 1982, Alan began performing magic show and doing strolling balloon animal sculpting for company picnics. He discovered that company picnics needed "an Activities Director for the Day". Alan started Alan Sands Entertainment and began hiring face painters, caricature artists, Mariachi, Hawaiian, Dixieland and Country & Western bands, inflatable bounce houses, and even entire carnivals, he supplied fun foods like cotton candy, snow cones, popcorn. Alan built carnival games and carnival game booths and supplied strolling performed from stilt walkers and mimes to impersonators, petting zoos, pony rides … and more … and he invented and began developing his trademark OlyPicnic Games. Utilizing the talents and creative energy of his Sister, Robin Sands-Fife; and Brother-in-law, Duncan Fife who own and operate All Star Showgrams and his best friend Paul Reaser, with input and the occasional prop rental from Rick Herns of Rick Herns Productions ASE's OlymPicnic Games continue still today to evolve and flourish into what you need for making your event as successful as ASE can help create.